Between the 11th and 13th of November the VII Gathering of Spanish Network of Platforms Against Waste Incineration in Cement Kilns took place in Alcalá de Guadaíra, Spain. This gathering coincided with the release of a statement from 55 civil society organisations calling for an immediate end to the burning of waste in cement kilns. A hundred participants from 50 different municipalities spent the weekend working on the topic of waste incineration, learning about its impact and the potential of zero waste alternatives to incineration, as well as sharing campaign strategies and discussing common actions for the future. The meeting ended with a demonstration in the “La Liebre” neighborhood, where a manifesto was read at the door of the Portland Valderrivas cement factory. It is worth noting that representatives from the Platform of Impacted Communities in Mexico and Zero Waste Europe/GAIA were present, in addition to all the platforms against waste incineration in Spain. This made Alcalá de Guadaíra the temporary capital of the fight against waste incineration in cement plants for the weekend. Moreover, the meeting provided new impetus to the Andalusian Network Against Waste Incineration in Cement Kilns, as they met for the second time to discuss their campaigns strategies. The successful opening of the gathering at the House of Culture of Alcalá included a panel of experts with José Luis Conejero, a member of the Platform Against the Incineration of Montcada and Reixac (Catalonia), Daniel López, former coordinator of the Waste Programme of the Andalusian Federation of Ecologists in Action, and Carlos Arribas, coordinator of the Waste Programme of the State Federation of Ecologists in Action. The three, together with Ruth Echeverría, biophysics expert from the Foundation Alborada, carried out a technical analysis of waste incineration in cement kilns from the perspective of employment, the environment and public health. On Saturday, the day was opened by a panel including Mariel Vilella, ZWE’s lead on Climate, Energy and Air Pollution Programme, who provided an overview of the global situation in on waste incineration in cement kilns, including recent research demonstrating how European climate finance is wrongly driven to promote these polluting activities. The panel included an expert researcher on an innovative system of monitoring health impacts from cement plants in Mexico. Creation of a communications team to facilitate coordination between all groups in Spain and improve outreach tools to the general public. Design and dissemination of a common slogan that summarises and makes visible the position against the incineration of waste shared by all the platforms of the Spanish State. Support the declaration of an International Day of Action Against Waste Incineration, and propose to hold it on May 13, in memory of the fire in the cemetery of used tires in Seseña. Promotion of municipal ordinances against the incineration of waste in cement plants. Promotion of studies on the economic costs of health impacts from waste incineration. 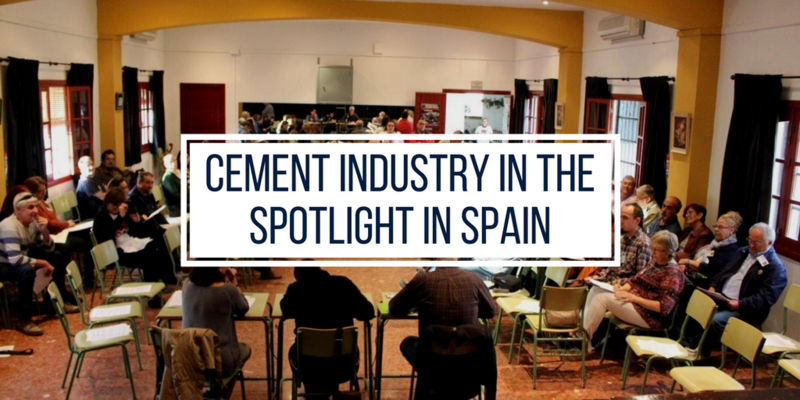 Performing a constant monitoring and control of data from the State Registry of Emissions and Contaminant Sources (PRTR-Spain) regarding the activity of the cement industry. Present a report to Congress Members with the basic principles of the sustainable waste management: the waste hierarchy, proximity principle, precaution principle, zero waste, ecodesign and especially the non-consideration of residuals as raw material or products. Strengthen ties with universities and educational centers and explore forms of active cooperation with these entities. Support the work of the network Retorna and the proposals on Deposit Return System (DRS) as well as reporting the pressure exerted by the corporation Ecoembes against the implementation of SDRs in Spain. Support the implementation of organised community composting systems. Promoting door-to-door waste collection systems, according to the model already implemented in localities such as Usúrbil and Argentona, as an alternative to the monopoly of large companies in the waste management sector. Once more, the weekend showed that the coordinated work of all platforms at the Spanish level is a consolidation of activism against this type of techniques and a boost to the struggle for the implementation of more sustainable and ecological measures in waste management. Bierzo aire limpio (Ponferrada, León), Plataforma contra la incineración de residuos en Los Alcores (Alcalá de Guadaira, Sevilla), 3mugak Batera, Olazagutia (Alsasua, Navarra) GOB- Grup Balear d’Ornitologia i defensa de la Naturalesa (Illes Balears), Residuo Zero Madrid (Madrid) A.VV de Morata (Morata de Tajuña, Madrid), Arganda (Madrid) Toledo Aire limpio (Toledo), Plataforma Albentosa Natural (Teruel), Lemoa Garbi (lemona, Bizkaia), Plataforma Almendralejo sin Contaminación (Badajoz), Plataforma contra la incineración de residuos de Niebla, A.VV. Palleja (Palleja, Barcelona), AVV. Trevol (san Vicents del Horts, Barcelona), Moviment contra la incineració a Uniland de Santa Margarida i Els Monjos (Santa Margarida i Els Monjos, Barcelona), CEPA-EdC (Catalunya), Sant Feliu aire net (Sant Feliu, Barcelona) APMA (Vilanova i la Geltru, Barcelona), Colectivo de Vecinos barrio de Sant Josep (Sant Viçent dels Horts, Barcelona) A.VV. Trevol (Sant Viçents del Horts, España) Vall de Ges, (Vall de Ges, Barcelona), Plataforma Buñol – Chiva,Molins de Rei, Plataforma Antiincineració del Congost (La Garriga, Barcelona) APQUIRA (Barcelona), CAPS, TELEMIR (Montcada i Reixac), FAVMIR (Federació de Associacions de Veïns de Montcada), Hoja Informativa (Montcada i Reixac), Plataforma anti-incineración de Montcada (Montcada i Reixac, Barcelona), A.VV. de Can Sant Joan (Montcada i Reixac- Barcelona), Plataforma Morata de Jalón, Aire Limpio Córdoba, GAIA, Zero Waste Europe. I am not very aware of the local context for waste management in Spain, but should not we think that the waste being burnt in that kiln is waste that could not have been recycled within economic boundaries? If the financial incentives along the waste hierarchy function properly, the materials recovery facilities will try to sort out materials to be sold on the scrap market for recycling as much as possible. Hence, in all logic, the waste being available for burning is waste that could not be recycled. This logic holds true in many European countries. In fact, the best way to fight against waste being “wasted” is to improve the waste collection and separation to prevent contamination as much as possible. But there will always be a fraction too contaminated for it to be cleaned and sent for recycling. So there will always be a fraction available for burning. In fact, the waste being brunt is not competing with recycling, but with LANDFILLING. Every ton that you burn is a ton that is not going to landfill. Also, is the will of stopping the practice based on scientific studies? (life cycle-based preferably). If so, can you tell me where to find them? Part of the problem at the moment is that financial incentives do not correctly correspond with the waste hierarchy, and in fact it is incineration, and waste burning that is receiving significant subsidies. For more information on this point, we have put together statements from MEP’s condemning these harmful subsidies and further explained them in our report “Harmful subsidies to waste-to-energy incineration: a pending issue for the Renewable Energy Directive and Bioenergy Sustainability Policy“. We would agree, that it is essential to fight for improved waste collection and separation, and we have detailed many examples of where these policies have succeeded in our case studies. However whilst there may always be contaminated fraction (It could certainly be far smaller) we would argue against the inherent primacy of incineration over landfilling, and this is backed up by our report ‘The Potential Contribution of Waste Management to a Low Carbon Economy’, written by the scientific consultancy Eunomia which makes the case that a development of incineration capacity can lead to a lock in and potentially more polluting outcome in the longer term, further to this our policy paper on Landfill Bans outlines why it is a false path to a circular economy. We believe that to increase recycling rates we also need to redesign our products so that they are more recyclable, and otherwise seeing recycling rates as fixed is letting unsustainable producers off the hook. We have further developed this position in our report on extended producer responsibility which found that ‘70% of municipal solid waste is product waste’. Our report ‘Air Pollution from Waste Disposal: Not for public breath’ also outlines some of our other concerns regarding waste incineration in cement kilns. If you have any further questions, we will be happy to respond.